During the first decades of the 20th century, Freeport was served by four trolley lines, two under the New York and Long Island Traction Company in addition to the Seashore Municipal Rail Road and the Freeport Railroad. The first proposals were made and initial planning was done in the late 1890s1, construction started in 18992, and service began in 19033. Over the years, proposals for additional lines were made, like one to be built between Freeport and Hicksville amid intrigue about out-of-state investors4, but these never materialized. After World War I, the trolley companies entered a period of financial crisis, and they had all ceased operations by 19265, at which point the bus lines took over completely. Before the trolley, aside from horseback or wagon6, transit options in Freeport were limited. As of the late 1700s, there was stagecoach service to Brooklyn, which took a day to reach downtown. 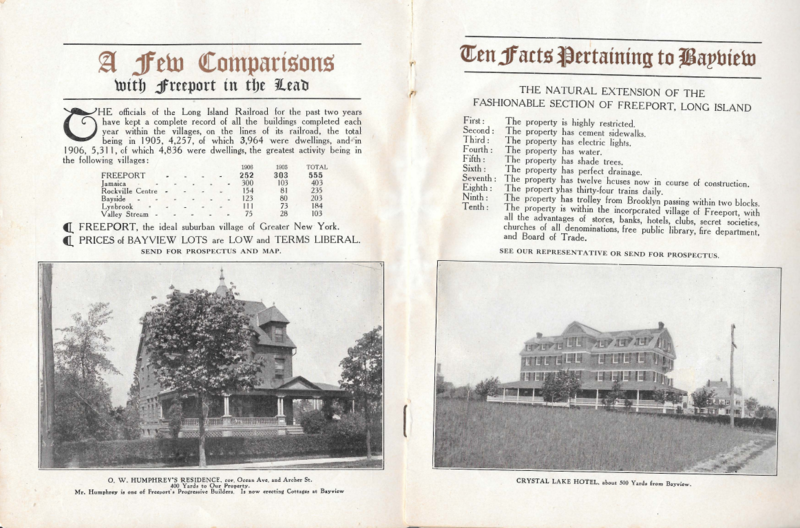 There was also well-traveled service to the south shore of Suffolk County, usually by way of Hempstead7. Until the end of the 19th century, however, most transit was on the water8. Until the trolley, there was no mechanized north-south transit in Freeport, and even today, traveling between north and south on Long Island without a car can be particularly problematic. 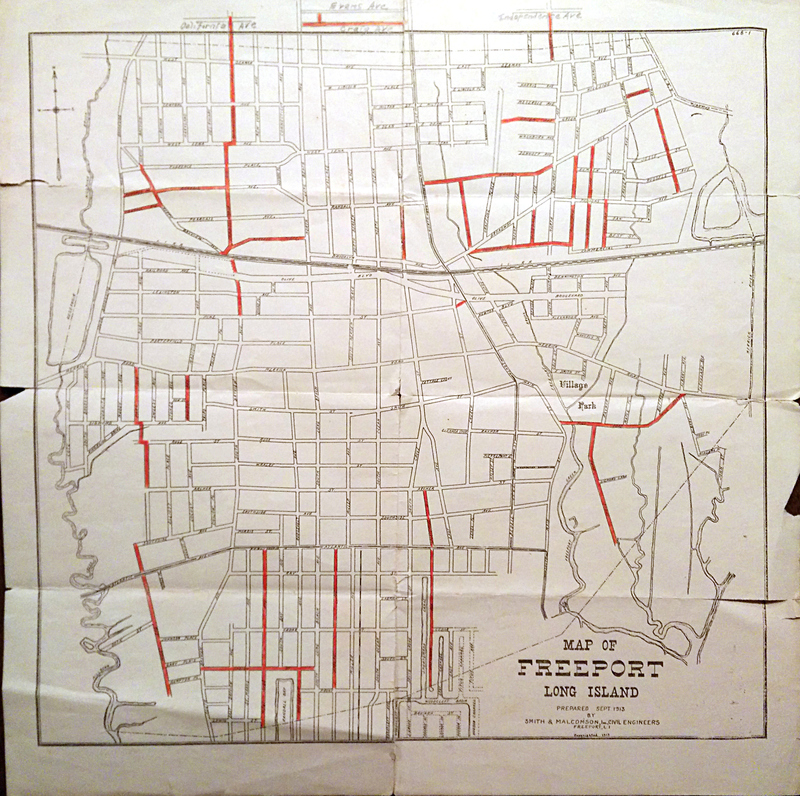 The map below shows the various trolley lines that existed in Freeport. often abbreviated as the N.Y. & L.I.T. Co. or just referred to as "The Traction"
The N.Y. & L.I.T. 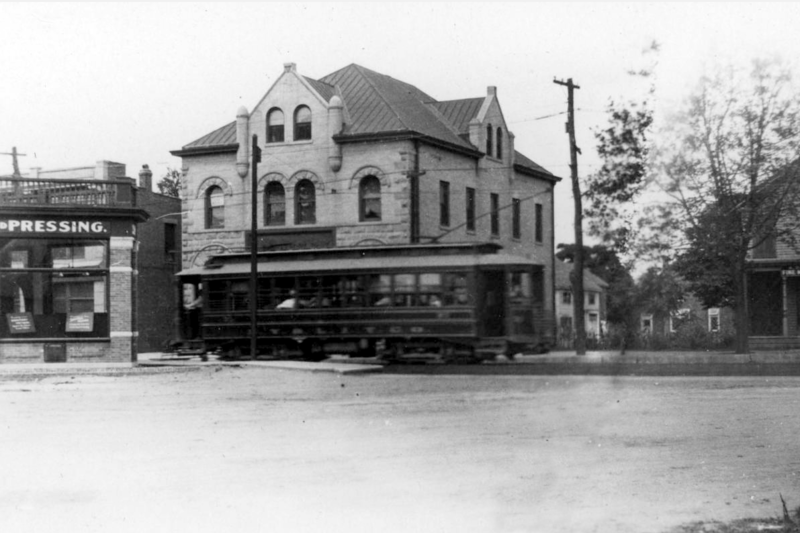 Co. was the first trolley company to serve Freeport and the last to end service. It started as the Mineola, Hempstead & Freeport Traction Co.13, emerging the winner in a competition for routes with the Nassau Belt Lines Traction Co.14, and it gradually established four lines in Nassau and Queens15. Two of these terminated in Freeport, one from Mineola, more or less along the current n40 bus route, and one from Brooklyn, which overlapped with the now-defunct n36. The N.Y. & L.I.T. Co.'s line between Mineola and Freeport cost about $210,00016, or, accounting for inflation, $5,700,000; however, to build a comparable line today would cost tens of millions of dollars. Until 1905, the trolley connected directly to the water, running southeast of Bedell St. to a dock on Freeport Creek17. Initially, the N.Y. & L.I.T. Co. also faced opposition from the Long Island Railroad, which originally supported the Nassau Belt Co.18. The last stumbling block was Freeport's LIRR crossing19. The railroad initially blocked the N.Y. & L.I.T. Co. from crossing its tracks, though the trolley company did secure passage in the end20, and the LIRR itself ultimately bought an interest in it21. 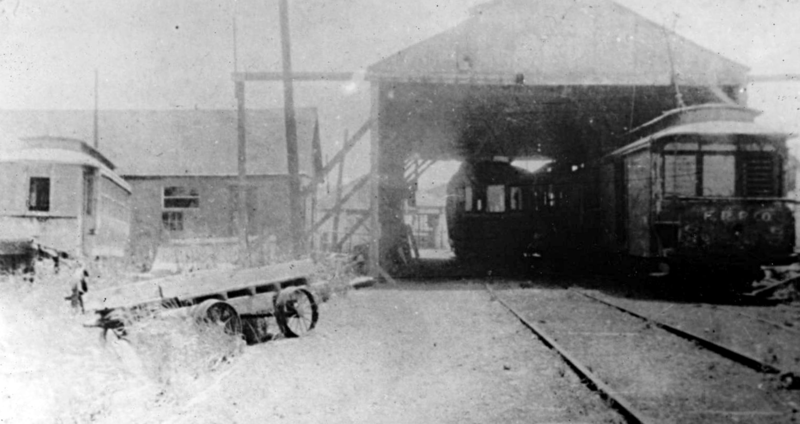 The Freeport-Mineola line opened with four cars in operation22. This picture shows an N.Y. and L.I.T. Co. trolley on Atlantic Ave. heading for Brooklyn23. The figure in front of the trolley appears to have been drawn in. The cars of the N.Y. & L.I.T. Co. were originally brown, but the company later switched to green, and later on, some were also orange25. The Seashore Municipal Rail Road was built by the Long Beach Transportation Co.27 and operated seasonally28 within the village limits. It carried passengers from the N.Y. & L.I.T. Co.'s Brooklyn–Mineola line to the ferries on the shore29. By 1914, the Seashore Municipal Rail Road had become part of the Freeport Railroad30, connecting the train station with the end of Woodcleft Canal. By late 1918, the trolley was operating under the Great South Bay Ferry Co.31. 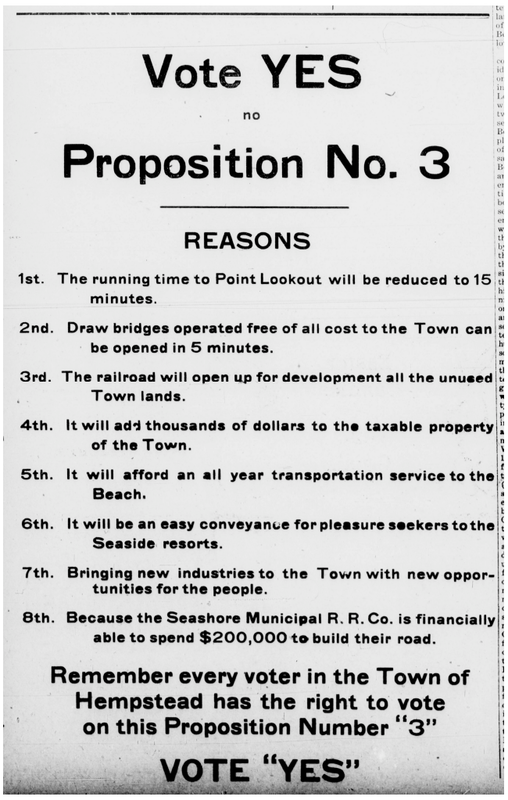 The advertisement above, run by Seashore Municipal Rail Road in the Nassau County Review in 1907, urges voters to approve the expansion of its operation. However, these plans were never implemented. 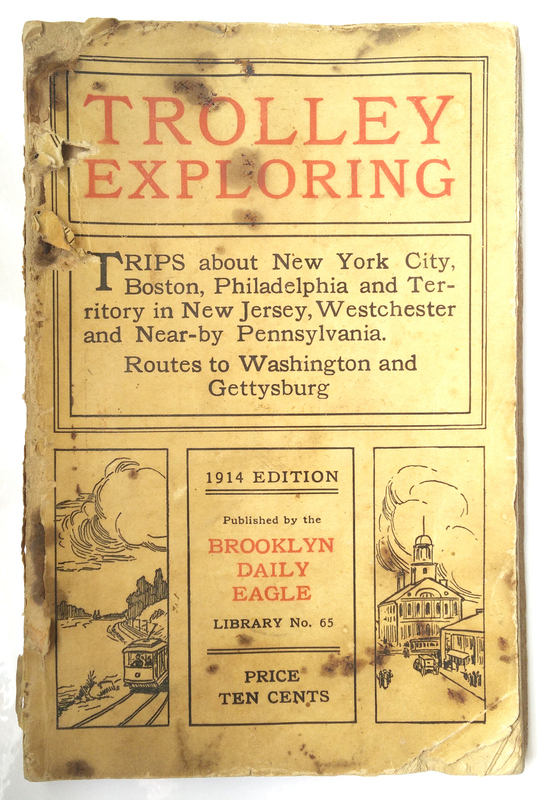 The broken lines on the above map of Freeport from 1913 show the paths of the N.Y. & L.I.T. Co. and Seashore Municipal Rail Road. The first photo above shows the Freeport Railroad's trolley barn, a facility for housing and maintaining trolley cars. The ones in the photo were probably painted green33, and off to the far left is possibly an older car that was taken out of service. The next picture shows one of the cars on the road, a group of people posing in and around it apparently commemorating some related event. At least some of the Freeport Railroad's rolling stock consisted of convertible cars, which featured sides that could be opened during the warmer days34. The Freeport Railroad also operated fully within Freeport and ran from near the train station down via Grove St., now Guy Lombardo Ave., to the ferries and fishing boats on the waterfront. The line was used heavily by fishermen, but it also carried significant numbers of passengers going down to the water for recreation.35 Like the N.Y. & L.I.T. Co, the Freeport Railroad was subject to competing interests, such as the LIRR. Though the line was originally intended to connect directly with the train station, the LIRR prevented it from reaching all the way along its planned route on Railroad Ave.36, now called Freeport Plaza. Initially, the trolley consumed about a third of the electricity generated by the Freeport Power Plant37, though it ultimately made other arrangements to buy power after a dispute with the village over the rate38. After being combined with the Seashore Municipal Rail Road, the Freeport Railroad ultimately went bankrupt and was bought at auction by the Great South Bay Ferry Co. initially for its equipment39. Being a ferry company, the standing of the Great South Bay Ferry Co. to take over a rail franchise was challenged in court40, though shortly thereafter it was apparently calling itself "the Great South Bay Ferry and Trolley Co."41. Even as it neared its final closing, the Freeport Railroad served over 3,000 weekly riders42. The trolley lines were owned and operated by highly-regulated private companies. 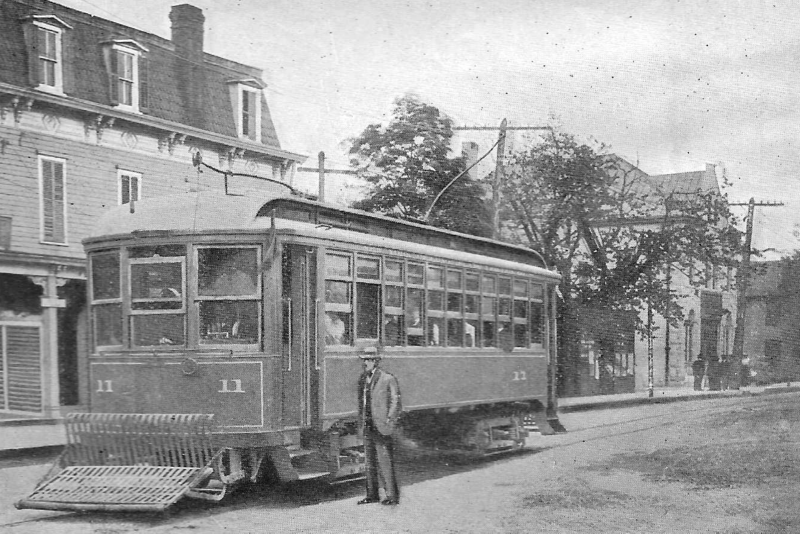 To start a trolley line, a company had to apply to the local government for a franchise, which gave it permission to operate along a certain route. As part of the arrangement, the company was charged a fee and had to post a bond to guarantee its obligations would be met. The Freeport Railroad, for example, paid the village $10,000 for its franchise in 191243, or about a quarter of a million dollars considering inflation. The franchises also placed a number of requirements on the operation of the trolleys, such as regarding safety, the frequency of service44, and the amount of the fare45. In Nassau County, the trolley companies were overseen by the Public Service Commission46, which went on to regulate bus service after their demise. The trolley companies had to provide their own equipment and install their own tracks and cables. They were also responsible to maintain the roads on which their tracks ran.47 As a result, the companies were often defensive about their rights of way, and there would be altercations with any other party interfering with their tracks48. By the 1920s, many of Freeport's roads, including some of those the trolleys ran on, were still unpaved and comprised of dirt or gravel49. If the road where a trolley operated was unpaved, part of the terms of a franchise might be that the company had to pave it to prevent the cars from kicking up too much dust50. Otherwise, the company might have to run a special car called a sprinkler down the tracks periodically to suppress the dust by keeping the road wet51. These were known to cause accidents, however, such as by startling horses as they went by52. The days when the trolleys were running reveal a much different view of mass transit on Long Island than exists today. 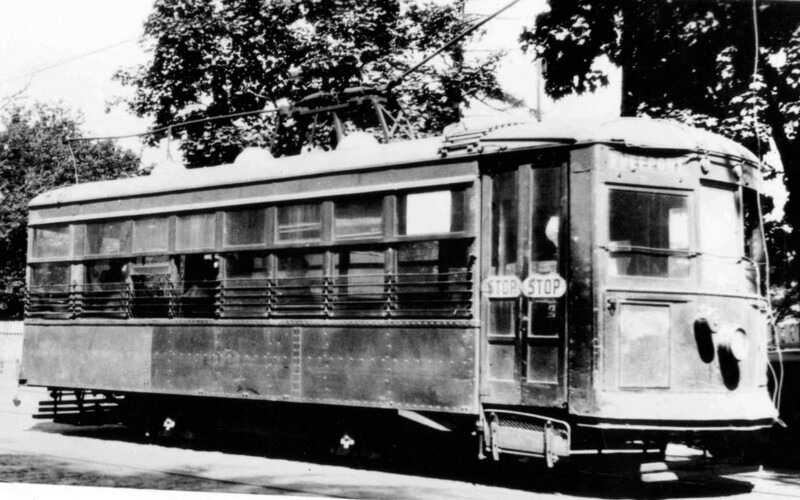 As serious plans for the construction of trolley lines were taking shape, the Nassau County Review characterized the mood about it as "trolley fever"53. 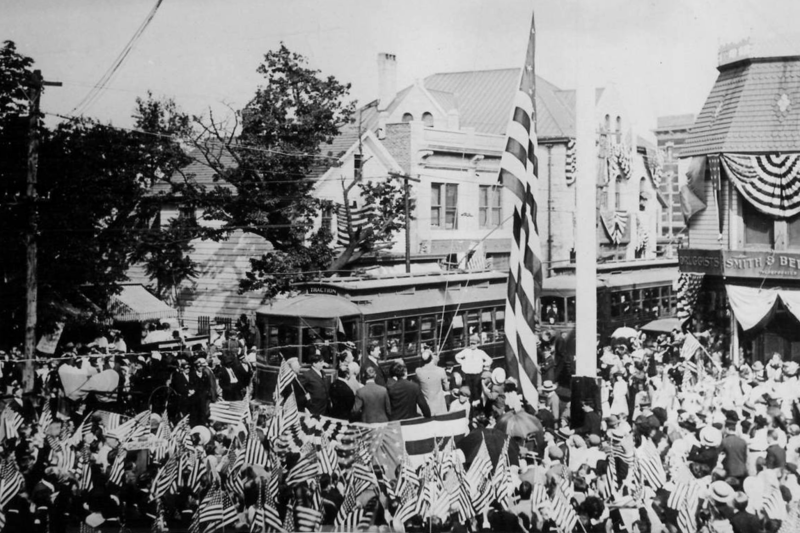 Likewise, the pride and excitement about the trolley is evident in the fanfare on display in the photo above, in which the arrival of Freeport's first trolleys, on the N.Y. & L.I.T. 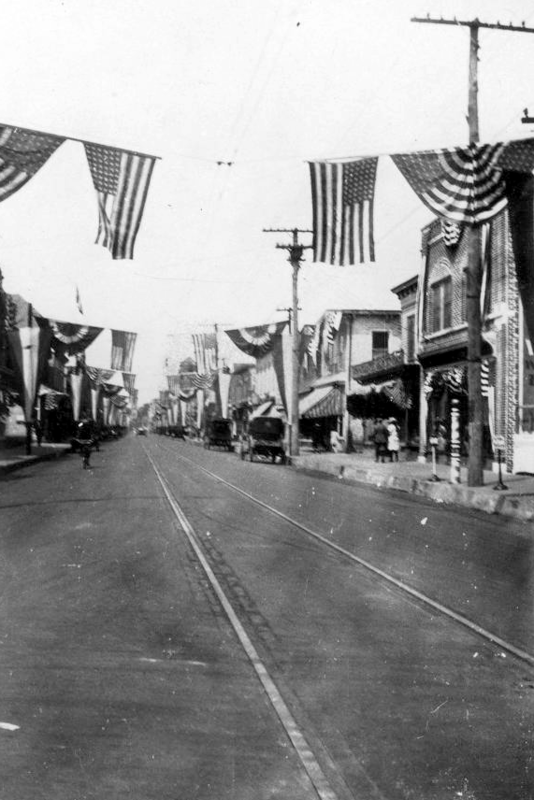 Co.'s Mineola line, is being celebrated on Main St.54. The opening of a new trolley line seemed to be a cause for celebration in whatever locale it was built55. Most people were enthusiastic about the start of trolley service56, though there were also some disputes with property owners along the routes57. During the run of the trolleys, the public took an interest in the service, petitioned about its shortcomings58, and campaigned for new stops59. The newspapers of the day asserted the trolleys would improve commerce and encourage development60. The trolley was used by a broader segment of the population than uses the bus today and was widely seen as a vital service61. At least in its earlier days, the trolley was often the best way to get around. Cars, meanwhile, were still a new thing and not in widespread use. Over the following decades; however, the wholesale suburbanization of Long Island elevated automobiles and depreciated mass transit, the beginnings of this trend evident even as trolley service was still winding down62. Today, transit is marked by sharp economic divisions in which bus riders mainly consist of those who don't have a car63. Today, far from getting any kind of fanfare, bus service generally faces indifference and decline. The newspaper ads above illustrate how the trolley was a fixture of daily life. As they reveal, a range of advertisers frequently gave trolley directions to their places of business, some even providing just a trolley stop as their location, while a piece of real estate being near a trolley stop was viewed as a selling point. This continued even as trolley service was coming to an end. These ads also give a sense of the times in general: electric light and electric heaters were still novel, coal stoves were still in general use, corsets and cameos were still in fashion, and much of Nassau County was still rural. Click the image to view the entire pamphlet as a PDF. Bayview development, which was established in the southwest of the village, used the trolley as a major selling point for its properties, touting access to destinations "Brooklyn, New York, Hempstead, Garden City, and Surrounding Villages" and claiming almost any location in Freeport was within a five-minute walk owing to the trolley connections64. 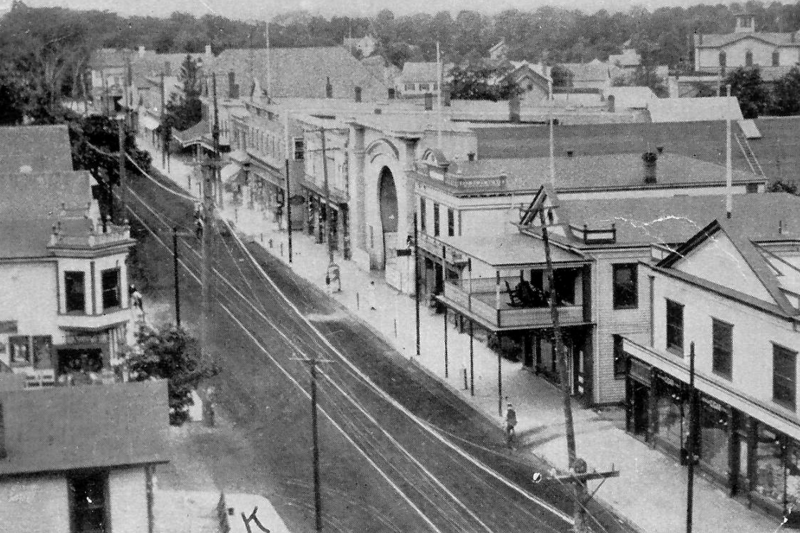 As seen in this view of Main St., the trolley lines were built with only one track for both directions65. Short areas of parallel track called sidings were built at various points, allowing opposing traffic to pass66. The lines also branched into multiple track sections in the trolley barns to store the cars side by side. The cars themselves were fully electric including not only the motors but also the lights and heaters, and power was drawn along a pole capped by a small wheel that made contact with electrified trolley wires overhead. The photos above were taken in one of the car barns of the Shore Line Trolley Museum in New Haven, CT on June 25, 2017. The car depicted was leased by the N.Y. & L.I.T. 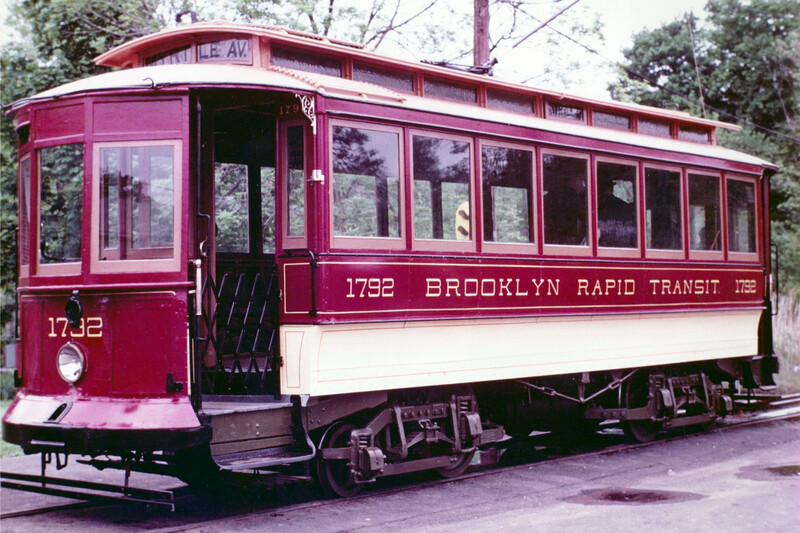 Co. from Brooklyn Rapid Transit and run on Long Island in 192367. At each end, the car has a position for the operator, or motorman68, who would switch depending on the direction of travel. Also, whichever of the two trolley poles wound up at the back of the car would be raised to contact the trolley wire and the other lowered, one visible on top of the car in the second photo. This car also features an iconic deck roof, which allows for a narrow row of extra windows around the car that act effectively as skylights and can be opened for ventilation69. Recreated graphics of the front and back are also available as SVG files. To ride the trolley, passengers would wait at a trolley stop and hail the car as it approached. Each stop was denoted by a number; for example, North Main St. and Colonial Ave. was stop #7671, and today there is a bus stop at the same location. Upon boarding, passengers would tell the conductor where they wanted to go, he would charge their fares accordingly, and give them their tickets72. An N.Y. & L.I.T. Co. ticket, showing the front and back, can be seen above. A coupon would would be torn off the side of the ticket for the ride. One is shown attached above, but at least some tickets had more than one for multiple rides73. At least some trolleys had a third crew member who would collect the tickets and otherwise assist with car operations. When passengers wanted to get off, they would stand up, and the conductor would ring a bell to signal the motorman to stop. Conductors also operated switches, allowing the car to enter sidings or change tracks, and derailers, forcing it to stop before going over railroad crossings, which sometimes also had a flagman stationed to control trolley traffic. Some trolley cars also had whistles to announce their approach.78 The average speed of a trolley was about 12 mph79, though village ordinance limited it to 8 mph in Freeport80. By the end, the N.Y. & L.I.T. Co. was down to a single crew member per car81. Conductors also operated switches, allowing the car to enter sidings or change tracks, and derailers, forcing it to stop before going over railroad crossings, which sometimes also had a flagman stationed to control trolley traffic. The schedules for the trolley were printed in the newspaper, and the N.Y. & L.I.T. Co. and Seashore Municipal Rail Road timetables above appeared in the Nassau County Review on August 16, 1918. 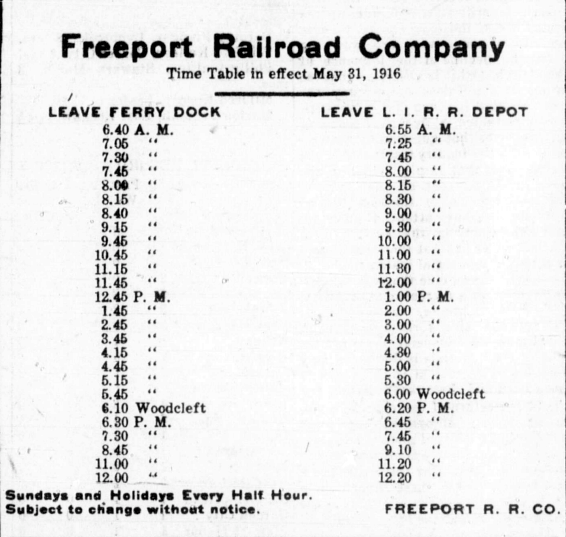 In addition, the Freeport Rail Road timetable depicted appeared in the same paper on August 11, 1916. Around this time, a major way of disseminating transit schedule information seemed to be through the papers, unlike today. The quality of service on the trolley was mixed. Service peaked in the early 1910s. At its height, at least on the N.Y. & L.I.T. Co. lines at peak times, cars were running as frequently as every 15 minutes or even more frequently for special events82. 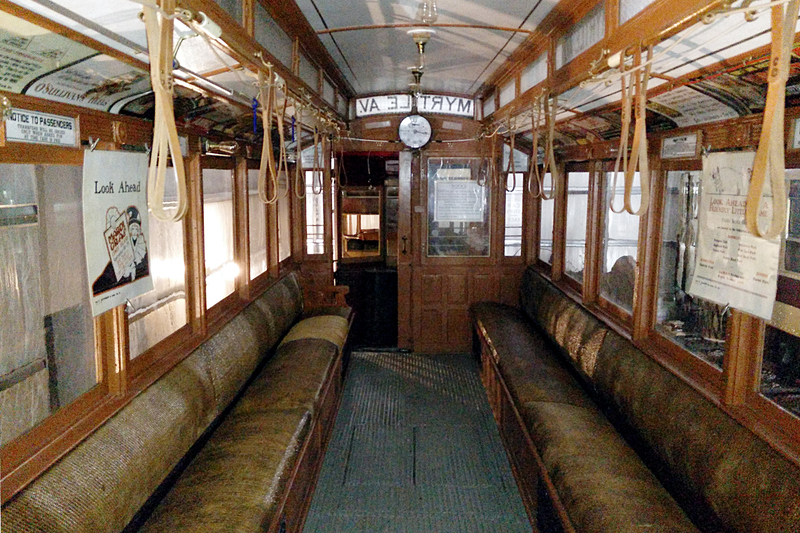 After World War I, the trolley commonly ran on headways of a half hour or more83. The Freeport and Seashore Municipal Rail Roads, meanwhile, were more seasonal and tended not to run as frequently as the N.Y. & L.I.T. Co. Throughout its run, there was criticism of the trolley's on-time performance and the manners of the crews84. In other cases, however, the trolley crews would go beyond what they were required to do, such as by waiting to meet a late train85 or helping to free a stuck vehicle86. Sometimes there were crimes on board, such as thefts87. Other times, there were also accidents, such as collisions with other vehicles, on a number of occasions resulting in fatalities88. Into the trolley's final years, the condition of the cars and the quality of the service had become decidedly poor89. In his book, New York & Long Island Traction Company, Vincent Seyfried imagines the trolley's arrival in Freeport from Mineola on a spring day. Perhaps the ride would have been taken on the car above, an apparently Freeport-bound trolley photographed on Front St. in Hempstead. By the time the headline "Buses or Trolleys?" ran in The Daily Review in March of 1921, two different bus lines were competing with the N.Y. & L.I.T. Co.'s Freeport-Mineola route, a stretch of it along Main St. seen above. The trolley company petitioned the village boards to formally impose the same regulations on the buses that governed the trolleys as their revenue was being destroyed by the bus routes, which were operating in a legal gray area.91 One particular issue was the practice of "nickel snatching," where a bus would drive along ahead of the trolley and grab its passengers, and their 5-cent fares92. The conflict between the buses and trolleys caused much debate in the early 1920s. Many politicians came out in support of the trolley and were critical of the buses. Louis Naisawalk, Garden City trustee, observed in a 1921 interview with The Daily Review that "automobile buses clutter roads, pay for no franchise, and take away legitimate business of trolley lines. "95 However, the apparent political support didn't save the trolleys, and the buses wound up out-competing them altogether. The bus operators seized on growing disgruntlement about the trolley's deteriorating service, and they began to get more public support as a result96. The on-time performance of the trolleys, for one thing, had fallen considerably by the 1920s, and the cars, which used to be cleaned daily, were now constantly dirty and in disrepair97. While there were fleeting bursts of improvement along the way, the overall trend was of decline98. The trolleys faced serious financial problems as they lost customers to buses and the automobile, and at the same time, were subjected to various lawsuits. One possible remedy was to increase the fares, but there was great pressure to stay at the standard five cents, and the N.Y. & L.I.T. Co. mainly just tried to redefine its fare zones. Another tactic it tried was to cut wages, which it raised again only to introduce more cuts. Especially as the financial situation worsened, lines and parts of lines wound up being abandoned. In one large blow to the N.Y. & L.I.T. Co., its car barn in Hempstead burned down, and much of its rolling stock was destroyed, after which it became more dependent on leased cars from the New York City trolley lines.99 Car #1792, seen again above, was leased from Brooklyn Rapid Transit after the fire100 and is the last surviving car to have been operated by the N.Y. & L.I.T. Co. The photo above shows a car driving along the trolley tracks on Main St. near the Freeport Bank101. Taking a broader perspective, as the automobile became more practical, popular, and economical, buses were favored for mass transit as they could use the same infrastructure. Nationwide, the growing oil and auto industries also pushed aggressively to replace electric traction with cars in particular. The slow speed of the trolleys let them coexist relatively well with pedestrians and horses but not with the much faster automobile. Technology for faster trolleys had been developed, but it was generally too late to help save the lines102. 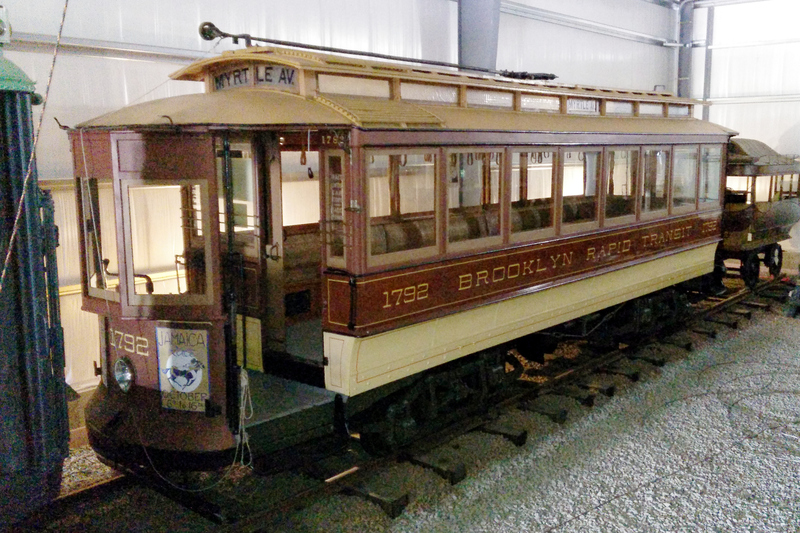 As it became clear that the last remaining trolley company in Freeport, the N.Y. & L.I.T. Co., would not survive, bus companies applied for franchises along its routes. Hempstead Bus Co. ultimately took over its Mineola–Freeport route, and Star Bus Lines took over the Freeport–Brooklyn route. In the last moments of the N.Y. & L.I.T. Co., frustrated crews abandoned their cars in the streets103. Later on, Roosevelt Bus started running a loop in the southern half of the village104, filling a similar role to the Seashore Municipal and Freeport Railroads. When trolley service ended, most of the cars that operated in Freeport were junked106, or in the case of leased cars, returned to their owners. The infrastructure, meanwhile, was dismantled starting with the trolley wires107. Part of the track survived to be torn up for the scrap metal drives of World War II, and some remnants survived at least as late as the 1950s108. The question of buses or trolleys is still relevant today. It has even come up recently on Long Island, such as in a proposal for a Nassau Hub line to link the Hempstead train station, Nassau Coliseum, Roosevelt Field, and Mineola Intermodal Center. In Freeport, it has been suggested to link the train station and the Nautical Mile with a trolley line109. However, nothing concrete has ever materialized. Partially adapted from "Tram." Wikipedia. 8/1/2017. There are also hybrid approaches that try to combine advantages of both: trolleybuses use overhead cables for power but don't need tracks, while bus rapid transit tries to make buses behave like trolleys, employing things like boarding platforms and dedicated bus lanes. Seyfried, Vincent F. New York & Long Island Traction Company. 1952. pp. 7-9 The Internet Archive. "Encouragement for the Trolley." Nassau County Review. 5/9/1899. NYS Historic Newspapers. Seyfried, Vincent F. New York & Long Island Traction Company. 1952. p. 48 The Internet Archive. "Another Trolley." South Side Messenger. 2/11/1914. NYS Historic Newspapers. Metz, Clinton. "The Indians Knew a Good Thing When They Saw It." Freeport Diamond Jubilee Seventy-Fifth Year 1892-1967. September 1967. p. 61. Freeport Historical Society collection. Seyfried, Vincent F. New York & Long Island Traction Company. 1952. pp. 40-41 The Internet Archive. Metz, Clinton. "The Indians Knew a Good Thing When They Saw It." Freeport Diamond Jubilee Seventy-Fifth Year 1892-1967. September 1967. p. 18. Freeport Historical Society collection. ; Seyfried, Vincent F. The Long Island Rail Road: A Comprehensive History. "Part One: South Side R.R. of L.I." 1961. p. 1 Wikisource. Metz, Clinton. "The Indians Knew a Good Thing When They Saw It." Freeport Diamond Jubilee Seventy-Fifth Year 1892-1967. September 1967. p. 18. Freeport Historical Society collection. "Work on Freeport Trolley." The Brooklyn Daily Eagle. 3/24/1902. p. 10 Brooklyn Newsstand; Seyfried, Vincent F. New York and Queens County Railway and the Steinway Lines, 1867-1939. 1950. p. 7 The Internet Archive. "LI Railroad to Place Gates at Porrier Crossing." Garden City News. 10/14/1926. p. 1 NYS Historic Newspapers; Seyfried, Vincent F. New York and Queens County Railway and the Steinway Lines, 1867-1939. 1950. p. 7 The Internet Archive. Zimmerman, Charles J. "A view from the archives." The Leader. 7/11/1991. p. 8 NYS Historic Newspapers. New York Heritage Digital Collections. Freeport Historic Photographs. 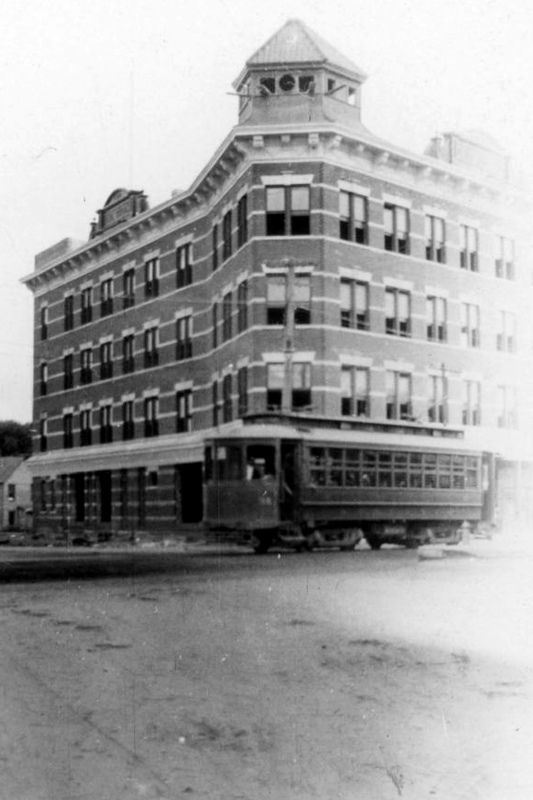 "Trolley Passing the Olive Building." Seyfried, Vincent F. New York & Long Island Traction Company. 1952. p. 43 The Internet Archive. "Trolley Hearing at Hempstead." Nassau County Review. 11/17/1899. NYS Historic Newspapers. "Long Beach Hotel Opening." The Brooklyn Daily Eagle. 3/20/1902. p. 8 Brooklyn Newsstand. Seyfried, Vincent F. New York & Long Island Traction Company. 1952. pp. 29, 33, 36 The Internet Archive. Seyfried, Vincent F. New York & Long Island Traction Company. 1952. p. 63 The Internet Archive. Freeport Long Island Illustrated. American Photograph Co. p. 5 Freeport Historical Society collection. Seyfried, Vincent F. New York & Long Island Traction Company. 1952. pp. 41, 54 The Internet Archive. Seyfried, Vincent F. New York & Long Island Traction Company. 1952. p. 57 The Internet Archive. "Freeport News." Nassau County Review. 5/17/1907. p. 1 NYS Historic Newspapers; Erving, William V.R. Department Reports of the State of New York. Vol. 12. J.B. Lyon Company, Albany. 1917. p. 183 Google Books. "To Begin Trolley Work." Nassau County Review. 11/01/1912. p 7 NYS Historic Newspapers. Freeport RR + Great South Bay R.R. Co. Ad. Nassau County Review. 7/29/1917; "Ferry Line to Take Railroad." Nassau County Review. 4/2/1920. p. 1 NYS Historic Newspapers. "Ferry Company Buys Trolley Line." Nassau County Review. 7/19/1918. p. 1; "Grove St Trolley Running." Nassau County Review. 8/30/1918. 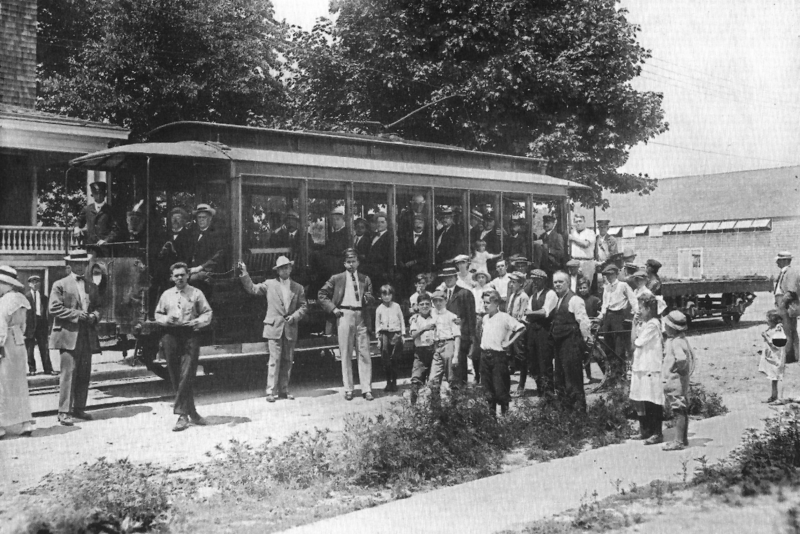 p. 1; "Grove Street Trolley Carrying Large Crowds." Nassau County Review. 9/6/1918. p. 1 NYS Historic Newspapers. Erving, William V.R. Department Reports of the State of New York. Vol. 12. J.B. Lyon Company, Albany. 1917. pp. 182-189 Google Books; "Public Notice." Nassau County Review. 4/26/1912. p. 5 NYS Historic Newspapers. "Grove St Trolley Pulls Village Steam Roller out of Mud Hole." The Daily Review. 4/18/1921. p. 3.; "Need of the Trolley." The Daily Review. 4/7/1921. p. 4. NYS Historic Newspapers. "Need of the Trolley." The Daily Review. 4/7/1921. p. 4.; "Shall the Trolley Continue to Run." Nassau County Review. 7/11/1920. p. 7. NYS Historic Newspapers. "May Condemn Way to Freeport Depot." The Nassau Post. 3/3/1914. p. 1. NYS Historic Newspapers. "Price for Electricity." South Side Messenger. 2/28/1913. p. 1. NYS Historic Newspapers. "Flat Rate for Trolley Canceled." Nassau County Review. 3/12/1915. p. 1. NYS Historic Newspapers. "Freeport Trolley Sold" The Nassau Post. 7/19/1918. p. 1. NYS Historic Newspapers. "Denies Petition." The Nassau Post. 7/4/1920. p. 5. NYS Historic Newspapers. "Main St. Parking before Board." Nassau County Review. 7/16/1920. p. 1. NYS Historic Newspapers. "Shall the Trolley Continue to Run." Nassau County Review. 7/11/1920. p. 7. NYS Historic Newspapers. "To Begin Trolley Work." Nassau County Review. 11/01/1912. p 7; "First Trolley on Grove Street, Tuesday, Aug. 5." South Side Messenger. 8/8/1913. NYS Historic Newspapers. "Bus Operations Curtailed by Hempstead Board's Action." The Daily Review. 5/4/1921. p 1; "Trolley Investigation Report." South Side Messenger. 3/15/1912. p 1 NYS Historic Newspapers. "Watch Trolley Fares." Nassau County Review. 9/4/1914. p 1 NYS Historic Newspapers; Seyfried, Vincent F. New York & Long Island Traction Company. 1952. p. 67 The Internet Archive. "Trolley Investigation Report." South Side Messenger. 3/15/1912. p 1 NYS Historic Newspapers. "Main St. Parking before Board." Nassau County Review. 7/16/1920. p. 1; "Local Topics" and "Village Trustees." Nassau County Review. 6/9/1911. p 1 NYS Historic Newspapers. "Freeport News." Nassau County Review. 5/15/1908. p 1; "It Makes a Difference." Nassau County Review. 5/30/1913. p 1 NYS Historic Newspapers. Wood, Herbert M., Baldwin & Cornelius Co. Inc. "Suggested Improved Roads and Streets for 1929 Paving Improvement Program." Report to Freeport Board of Trustees. 1/25/1929. Freeport Historical Society collection. "Local Topics." Nassau County Review. 8/26/1910. p 1 NYS Historic Newspapers; Seyfried, Vincent F. New York & Long Island Traction Company. 1952. p. 95 The Internet Archive; "Main St. Parking before Board." Nassau County Review. 7/16/1920. p. 1. NYS Historic Newspapers. "Trolley Opening." South Side Messenger. 8/20/1909. NYS Historic Newspapers. "Another Ship Ashore." South Side Messenger. 8/20/1909. NYS Historic Newspapers. "Hearing on the Trolley." Nassau County Review. 11/24/1899. NYS Historic Newspapers. New York Heritage Digital Collections. Freeport Historic Photographs. "Arrival of the Trolley Cars." "Trolley Hearing at Hempstead." Nassau County Review. 11/17/1899. ; "Trolley in a Week." Nassau County Review. 8/1/1913. p. 1 NYS Historic Newspapers. "Trolley in a Week." Nassau County Review. 8/1/1913. p. 1 NYS Historic Newspapers. ; Seyfried, Vincent F. New York & Long Island Traction Company. 1952. p. 57 The Internet Archive. "Trolley Investigation Report." South Side Messenger. 3/15/1912. p 1 NYS Historic Newspapers; Seyfried, Vincent F. New York & Long Island Traction Company. 1952. pp. 7-9, 12, 85 The Internet Archive. "Freeport News." South Side Messenger. 2/8/1912. NYS Historic Newspapers. "Lynbrook." Nassau County Review. 2/11/1910; "New Trolley Company Means Business." South Side Messenger. 11/1/1912. p. 1 NYS Historic Newspapers. "Of Interest to Our Visitors." Nassau County Review. p. 1 9/4/1914; "Bellmore." South Side Messenger. p. 1 10/1/1909 NYS Historic Newspapers. Onslow-Moore Company. Bayview Freeport, L.I. pp. 3, 6 Freeport Historical Society collection. Seyfried, Vincent F. New York & Long Island Traction Company. 1952. p. 79 The Internet Archive. E-mail from Jeff Hakner, Shoreline Trolley Museum, East Haven, CT. 7/8/2017. "It Makes a Difference." Nassau County Review. 5/30/1913. p 1 NYS Historic Newspapers. American Public Transportation Association. "Definition: Roof Structures." APTA Streetcar and Seashore Trolley Museum Logo Heritage Trolley Site. "Those Trolley Receipts." Nassau County Review. 12/6/1912. NYS Historic Newspapers. "Suit Against Trolley Co." Nassau County Review. 7/11/1913. p. 1 NYS Historic Newspapers. "Trolley Collides with Auto Bus." The Nassau Post. 1/22/1914. p. 1; "Those Trolley Receipts." Nassau County Review. 12/6/1912. p. 1 NYS Historic Newspapers; Seyfried, Vincent F. New York & Long Island Traction Company. 1952. p. 29 The Internet Archive. "Ready for Jr. O.U.A.M. Convention." Nassau County Review. 1/4/1914. p. 1 NYS Historic Newspapers. Seyfried, Vincent F. New York & Long Island Traction Company. 1952. p. 41 The Internet Archive. "Trolley Investigation Report." South Side Messenger. 3/15/1912. p 1 NYS Historic Newspapers; Seyfried, Vincent F. New York & Long Island Traction Company. 1952. p. 75 The Internet Archive. "Local Topics." Nassau County Review. 9/3/1909. p. 1; "Local Topics." Nassau County Review. 1/16/1914. p. 1; "Those Trolley Receipts." Nassau County Review. 12/6/1912; "The Trolley Service." Nassau County Review. 12/20/1912. p. 1 NYS Historic Newspapers. "Local Topics." Nassau County Review. 11/08/1912. p. 1 NYS Historic Newspapers. "Grove St Trolley Pulls Village Steam Roller out of Mud Hole." The Daily Review. 4/18/1921. p. 3. NYS Historic Newspapers. "Bellmore." South Side Messenger. p. 1 10/1/1909 NYS Historic Newspapers. "Freeport News." Nassau County Review. 9/13/1912. p. 1; "Freeport News" and "Local Topics." Nassau County Review. 10/4/1912. p. 1; "Trolley Collides with Auto Bus." The Nassau Post. 1/22/1914. p. 1; "Trolley Hits a Truck." The Nassau Post. 2/20/1914. p. 1 NYS Historic Newspapers; Seyfried, Vincent F. New York & Long Island Traction Company. 1952. p. 71 The Internet Archive. "What about the Trolleys and Buses." Nassau County Review. 2/11/1921 p. 4 NYS Historic Newspapers; Seyfried, Vincent F. New York & Long Island Traction Company. 1952. p. 24 The Internet Archive; Seyfried, Vincent F. Story of the Long Island Electric Railway and the Jamaica Central Railways, 1894-1933. 1951. pp. 79, 84 The Internet Archive. https://archive.org/details/newyorklongislan00seyf. Seyfried, Vincent F. New York & Long Island Traction Company. 1952. p. 35 The Internet Archive. "Buses or Trolleys." The Daily Review. 3/23/1921. NYS Historic Newspapers. "What about the Trolleys and Buses." Nassau County Review. 2/11/1921 p. 4 NYS Historic Newspapers. Seyfried, Vincent F. New York & Long Island Traction Company. 1952. p. 97 The Internet Archive. "Bus Operations Curtailed by Hempstead Board's Action." The Daily Review. 5/4/1921. p 1 NYS Historic Newspapers; Seyfried, Vincent F. New York & Long Island Traction Company. 1952. p. 86 The Internet Archive. "Stick to Trolleys if Run Properly is Growing Slogan." The Daily Review. 3/9/1921. p. 1 NYS Historic Newspapers. Seyfried, Vincent F. New York & Long Island Traction Company. 1952. pp. 97, 99, 102 The Internet Archive. Seyfried, Vincent F. New York & Long Island Traction Company. 1952. p. 84 The Internet Archive. New York Heritage Digital Collections. Freeport Historic Photographs. 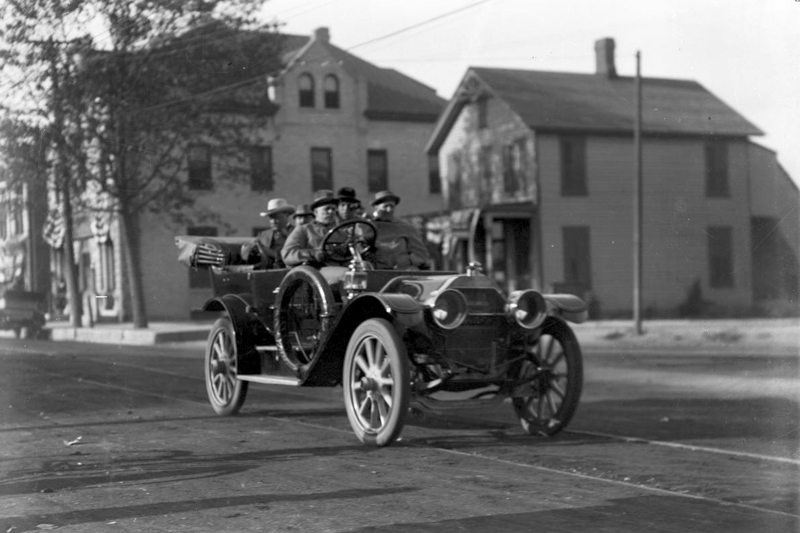 "Car on South Main Street." "High Speed Trolleys." Manhasset Mail. 9/18/1930 p. 2 NYS Historic Newspapers. Seyfried, Vincent F. New York & Long Island Traction Company. 1952. pp. 100-101 The Internet Archive. Seyfried, Vincent F. New York & Long Island Traction Company. 1952. p. 104 The Internet Archive. "Rebuilding Freeport, efforts underway." The Leader. 9/24/2009. pp. 1, 10; "Freeport through the Eyes of Young Urban Designers." The Leader. 12/10/2009. pp. 1, 15 NYS Historic Newspapers.